Wow, it's almost the fifth day of the new year and I'm just now wishing everyone a Happy New Year; I can see things haven't completely changed; I'm still a smidge late on things. Perhaps that should be one of my new year's resolutions, try to be on time; I hate watching time so I just don't see it happening. I started out the year on a creative high you could say. I attended a crop at the locally owned scrapbook shop in my area and was very productive. 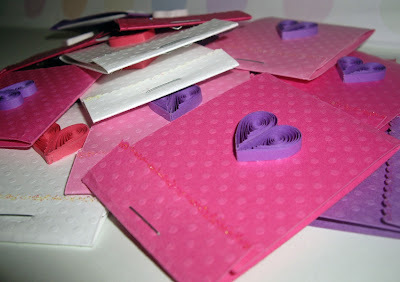 I finished 20 cute little valentine matchbooks, each with 12 sheets of paper, cut by me. The front of each matchbook has a tiny scalloped edge with a little bit of glitter ( I love glitter! ) and a quilled heart. 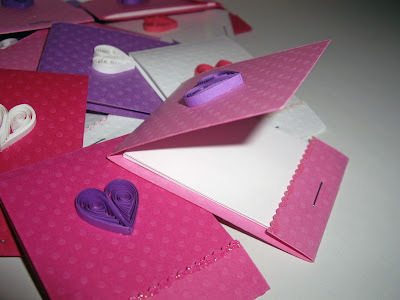 These are samples that will be part of the January 2010 Valentine Themed Boxes at Sampler Village, go check them out and see what it's all about. 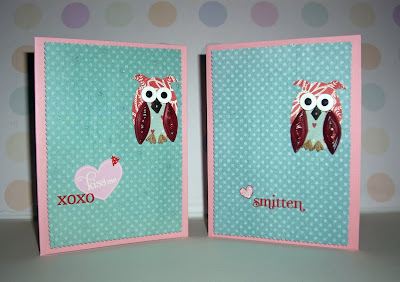 After finishing these up I started on Valentine cards with owl magnets attached; they're a card and a gift all in one; perfect to give to your favorite Valentine this year. 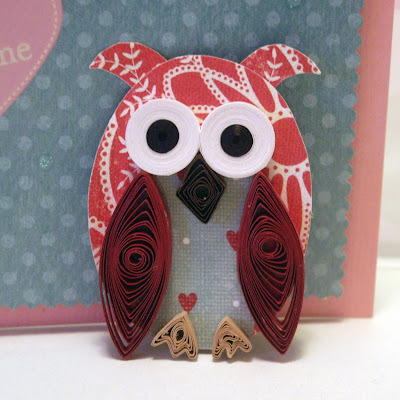 The owl magnet fits perfectly in a hole on the front of the layered card, once the owl is removed there's a little secret behind there, too cute! I hope everyone is having a fabulous 2010 so far, I think this is going to be a good year. These are ADORABLE!!! I can't wait to get to another crop with you guys. It seems like it's been forever and a day since I've been able to join in the fun. BTW, I watched Better Off Ted last night and I laughed pretty hard. I think you're onto something! Oh, I missed it; I can never remember what night it's on - I just caught up on this season over the weekend and I definitely was laughing, funny show for sure. I do think you need to crop with us soon, it was just Tressa and I this past week - there's one on the 16th, let me know if you're going. that owl is really cute!! so glad i stumbled upon this blog!